Frankly, it all sounded pretty far-fetched to me, and profoundly exaggerated. Mind you, I had never been to either country, so I nodded politely at the narrative, shook my head at the gross injustice of it all, and reconsidered my envy at their having gone on the buddy trips that I had had to miss for whatever legitimate reason. Eventually, in 2011, I found no impediment on my schedule to prevent me from joining a group of stalwart old pals on a golf trek to northern Wales and the Southport coast, home most famously to the fabulous Royal Birkdale. Remembering the tales of Nordic heroics past by this gang, I packed accordingly: toque, gloves, rain gloves, rain pants, rain hat, rain jacket, rain undies, wind block for the lips, and a wee dram of fortifying scotch for the lower extremities. Never used any of it. Every day was sunny, warm, and the wind was nothing but a source of pleasant cool when the temperature threatened to be unnecessarily comfortable. Now I truly doubted the tales of proud defiance of the elements that I’d had to endure from the lads prior to. Then, in July 2015, I managed to latch onto a trip to Scotland with a dozen adventurous old boys from Devil’s Pulpit. We enjoyed two weeks of daily golf, starting at Prestwick in the southwest, and putting out in Carnoustie in the lower northeast. To a man, THEY all had tales of golf blizzards previously withstood, so I was glad again that I had packed the Arctic wardrobe. But again, 14 days of sun, calm, and moderate told me that there was a fabrication conspiracy going on here, and it was directed only at one person: me. This is when I coined the term “fake news”, which I later gave to Donald Trump to great effect. So fast forward to last week, when I giddily boarded a jet bound for Dublin, and a short but magical schedule of golf in Northern Ireland. Anyway, mindful of the myths of bad weather I’d been subjected to, I packed “lite”. A waterproof jacket, yes. But no other defense against wind, or rain, or cold other than sweaters which were really more fashion statements than climatic devices. Standing on the first tee of the championship course at Royal County Down Golf Club would normally have been a dream come true for me. 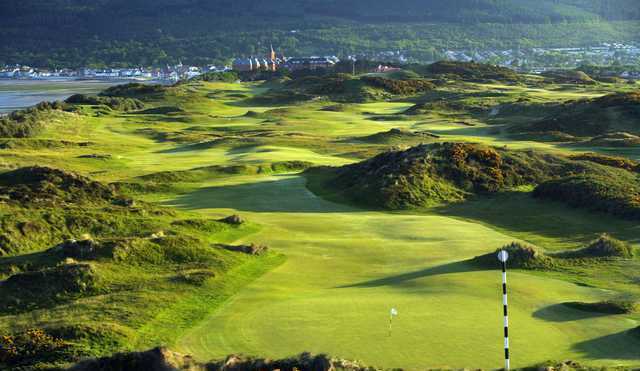 RCD is considered the finest golf course in the world outside the United States by Golf Digest, one of the ten Number One golf publications in the world. Most of the other Number One golf publications rank RCD in the top three in the world, U.S. included. But no first tee dream I’ve ever had took place with rain coming in at a zero degree angle, blown by 40mph wind, and a temperature only defined as sub-Arctic. And this was not at the crack o’ dawn. It was slightly before lunchtime, and the forecast for the rest of the day was an optimistic “more of the same”. And here is your intrepid reporter, having so insouciantly not packed for the conditions, standing in khakis already rain-soaked from the putting green, wearing a 25-year-old model Export ‘A’ Skins Game-logo’d rain jacket, jaunty sun visor (my trademark look) which blocked the rain in my face only if I looked straight down at my shoes, and wondering if my travel insurance covered both frost-bite and pneumonia. Hitting a friggin’ golf ball was the last thing on my mind. As it happened, we soldiered on, in conditions that Erik the Red might have taken shelter from. And as it happened, I abandoned what would have been my normal habit of simply moaning at the conditions and cursing my bad fortune, and decided to embrace the hurricane and look somewhere for the bright side. I was, after all, on (one of) the World’s Greatest Golf Course. And with that attitude, I played fairly well… as in, I broke 100, which even Tiger might have struggled to do in similar conditions. As it happened as well, I absolutely loved the golf course, and could see why others far more expert and discerning before me, had loved it as well. Bordering the Irish Sea, with the outline of the Isle of Man visible in the distance (on a normal day), RCD is placed on a property that Himself created with wind and water over several centuries, and Old Tom Morris found places for tees, greens, and lawn mowers – which were undoubtedly sheep for the first few decades of the course’s existence — in between the dunes, some 129 years ago. Old Tom’s work has been refined and revised by several notable designers in the decades since, but each improvement has been impeccable and if you didn’t know it, you wouldn’t know it by looking. I’ve read some criticism online by purists who complain that a recent re-do of the 17th hole is sacrilege to the purity of links golf, because it includes a relatively small pond in the middle of the fairway, and water hazards on links courses are supposed to be a no-no, unless they’re part of a sea or an ocean. But my authentic local caddy scoffed at this notion, explaining that the water hazard was the outward manifestation of a natural underground spring, so purists be damned. As it happened, I didn’t get acquainted with the water hazard, as my ball never encountered the fairway on that hole. Suffice it to say, that in spite of my continued struggle to keep blood circulating in my body, my one and only trip to Royal County Down Golf Club is one I shall never forget, in a good way. In my lifetime ranking of Golf Courses I’ve Played, which is (honestly) maintained in an Excel file on this very laptop, I’ve placed RCD in my all-time top ten… not high enough to displace Sunningdale Old outside London at the pinnacle, but probably shoving its neighbor St. George’s Hill, down a peg, and tying with Birkdale and Turnberry at the top in the links category. One of the pleasures of playing RCD was the fact that our hotel was, literally, less than 150 steps from the first tee, even in audibly-squishy shoes. 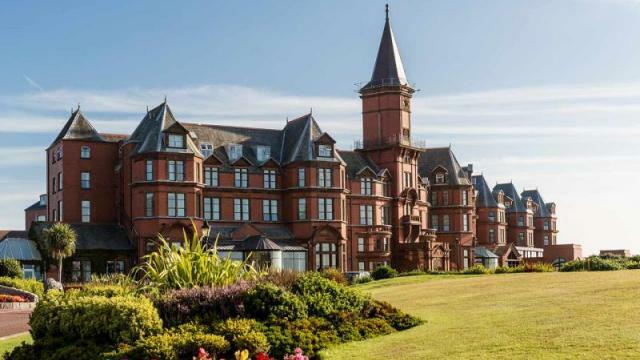 The Slieve Donard Resort and Spa, named after the moderately-sized mountain in whose shadow the whole town of Newcastle rests, is a stately, dark terra-cotta-coloured edifice of handsome profile, built in 1897, with a glorious overlook of the beach and the sea. It still proudly boasts that Charlie Chaplin was once a guest there, and in honour of the visit, they’ve named the Dining Room after the Tramp. A nice touch, but the connection to a famous movie star isn’t needed; the place is movie star quality all on its own. And I can state emphatically, from personal experience, that the 30-foot-long hot tub, beside the tropically heated swimming pool, looking out at the Irish Sea from behind a plate glass window, was all the spa I’ll ever need for the rest o’ me life. 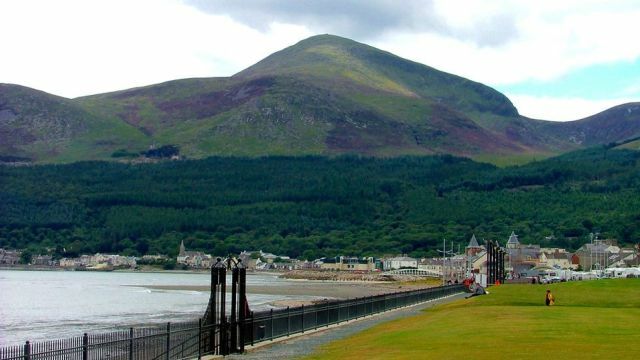 I really can’t imagine why anyone visiting Newcastle (on the southeast coast, 90 miles north of Dublin) would ever consider staying anywhere else than the Slieve Donard. That’s not to denigrate any of the other lodging options in the area, but if you’re going to treat yourself to playing a truly great golf course, then why not blow the wad and stay at an equally great and memorable hotel? So, after a lovely meal in the Chaplin Room, two hours of aiming a hair dryer at every piece of clothing worn during the day (note to self: remember next time that hair dryers can burn the bejesus out of the tips of your fingers), and a well-deserved sleep, our gang was up and on the bus next morning for a 30-minute jaunt up the coast to play the links at Ardglass. This was not a name that I was familiar with, and wasn’t too concerned about. I was more occupied with steeling myself mentally for the fact that it was still bloody cold, bloody windy, and the partially cloudy conditions of the morning did not conceal the fact that many of yonder clouds contained what they call, in Ireland, rain. I would personally define it as “horizontal icicles of death”. Nonetheless, again we soldiered on. 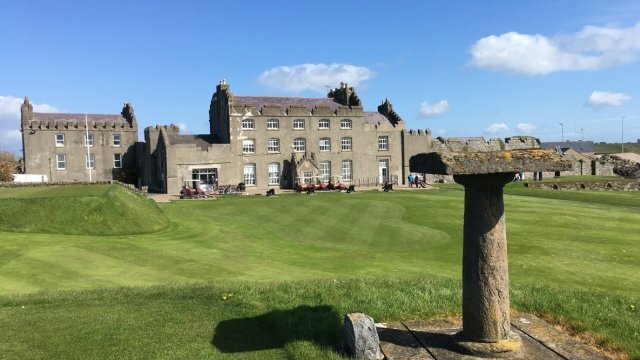 Ardglass is situated on the edge of one of hundreds of charming little towns that dot the coast of Ireland, all the way around. The golf course’s claim to fame is that its clubhouse is the oldest building being used for this purpose in the world, dating back to 1405, when Chris Columbus wasn’t even a glint in anyone’s eye. It is in fact, an old castle, and quite charming, but unfortunately, provenance has no effect on weather. It was sunny, at least, when we teed off on a very interesting first hole. The opening drive requires a carry of 180 yards up and over a cliff, which sounds like a piece o’ cake until you determine that the wind in your face is blowing just below gale force. Fortunately, there’s about a 180-yard bailout to the right, but this will make your second shot about 220 yards uphill, straight into the gale. Personally, I don’t have a club for that. The hole is listed on the card as 335 yards, par 4. In these conditions, par 6 would be generous. But that’s the thing with links golf. Terms like “par” and “distance” are merely abstract, and often irrelevant, when embroiled with other terms like “wind”, “rain”, “out of bounds”, “knee-high rough that your ball will certainly blow into”, “45 degree stances in dunes while aiming into the wind”, “ocean hazard”, “gorse bushes that can rip the pants off your legs”, “bunkers deep enough to bury three family generations”, and “one’s golf ability or lack thereof”. These terms usually do not apply on lush North American parkland courses, otherwise known as “easy” golf. From the tips, Ardglass is listed at 6,268 yards, par 70. Sha right. Honestly, it played like 8,268, par 94. On those criteria, I shot par, and I was damn proud of myself. But whereas at home I’d be whining and moaning about the injustice of it all, I am now somewhat of a links veteran, and all you can do is revel in the experience, as I did. 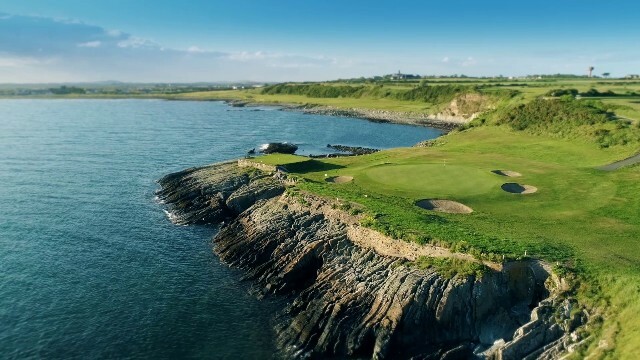 Ardglass is a little more rugged, less pretty and less refined than its foxier sister at RCD, but it is rated highly by golfers in Northern Ireland, who appreciate its character and subtlety. Every hole at Ardglass has a magnificent view of the sea, which is pretty neat. One of the fellow travelers on our trip was noted American golf writer Tom Coyne, who wrote an outstanding book called A Course Called Ireland. It’s a very funny and very informative document of his four-month WALKING golf tour around the entire circumference of Ireland, in which he played 56 links courses. Tom loves Ardglass with a passion. Me, not so much, but I defer to his eye. 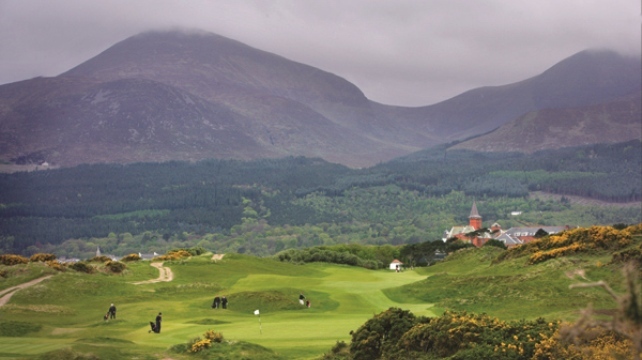 It’s certainly not a course to miss if you’re coming all the way to play Royal County Down. I now realize I’ve taken up way too much of your time on all this, and I’m only half-way through my travelogue. So I think I’ll leave it there for now, and bring you back to Ireland in the coming weeks, same time, same channel. That’ll give you time to buy yourself some Guinness and savour my account of Royal Portrush and Portstewart, which surprisingly will include references to wind, rain, and cold. One final note: I’d be remiss and very rude if I did not include a sweeping bow of thanks to two fine restaurants in Newcastle, steps from the hotel, that welcomed our hardy band of warriors: Vanilla, and Brunel’s, whose establishments are both well worth a visit.